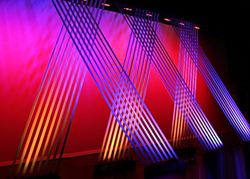 ATOMIC, a creative company providing rental solutions, set construction, design and production services for the live event industry, announces a new soft goods product line: StretchSet. Get ready to bend the rules with this collection centered around flexible, stretchy tension fabric. StretchSet products attach easily to any pipe or truss with no tools or extra hardware. Made with elastic fabric, StretchSet modular fabric backdrops let you draw in 3D across your space with sweeping stripes of light and color! The first StretchSet product to hit the shelves is Udon, featuring several thin strips of elastic fabric that stretch and twist across the stage. Udon was inspired by complex string art installations, parametric curves with interwoven lines, and maybe some delicious noodles too. The stretch fabric, arranged through space with the help of simple rigging or Pipe and Base, visually floats somewhere between 2D and 3D, and makes an impressive backdrop for any type of environment. Udon’s linear stretch is available in lengths ranging from 15-20’ and 20’-30’. StretchSet products are a breeze to set up on site with no tools (or headaches!) necesary. Designers, get ready to stretch your environments to the limit with StretchSet. Call us today at 717-626-4408 about renting Udon, the first StretchSet product to hit the shelves, and to request CAD files for your next design!